Franklin Laine Tomes, 59, allegedly has a unique way to convincing neighbors to stop making noise . . . he fires a dozen rounds from his AK-47. Tomes is now under arrest in Oregon for the incident at an apartment complex in Portland, Oregon. He allegedly hit two men as they fled and then barricaded himself in his apartment until finally surrendering to SWAT officers. Tomes had previously complained about the kids of one of the victims making too much noise. CBS affiliate KOIN described a noise dispute between Franklin Laine Tomes and upstairs neighbors that culminated in the parking lot. He allegedly grabbed his rifle from his car and loaded it. Witnesses said that the pointed the gun at them but did not fire. After returning to his car, Tomes later grabbed the gun again and fired at least a dozen rapid fire rounds at two individuals as they ran away. Jose Gaeta, 20, and Tristan Smith, 20, were later hospitalized with gunshot wounds. Gaeta was hit three times, including a round in each leg. Smith was hit in the shoulder. Other rounds entered Smith’s apartment. Tomes has been charged with two counts of first-degree assault, two counts of pointing a firearm at another, unlawful use of a weapon, four counts of reckless endangering and two counts of attempted murder. The AK-47, or Kalashnikov, can fire fully automatic. It has been banned since 1986. Apparently, having a law against owning this weapon, against attempted murder, against firing in a public space, and various other laws did not stop a criminal from breaking the law. He broke the law on several levels. I’m glad no one died, especially the kids, and hope those injured recover. I would also like to know if there were any actionable red flags leading up to this point. I assume that since there was “rapid fire” that this was the banned fully automatic Kalashnikov. There is a semi-automatic version, but it cannot fire that fast. No kidding. Maybe he should have thought twice about living in an apartment building if he was so sensitive to noise. 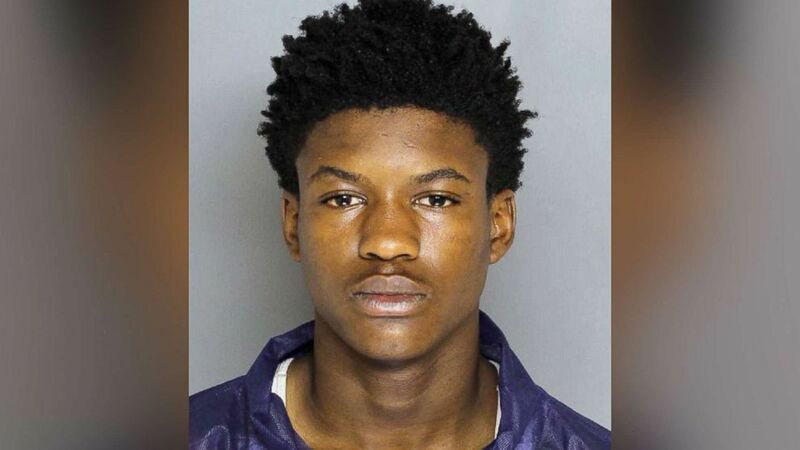 “The West Baltimore teen’s crime spree began in December, prosecutors say, and, over the subsequent months, he stole four cars, skipped court dates and escaped from a juvenile center. When a Baltimore County police officer confronted him Monday, 16-year-old Dawnta Harris ducked down and accelerated a stolen Jeep, running over Officer Amy Caprio as she opened fire, prosecutors say. This is a symptom of a trend in this country, to ignore or disparage official justice (i.e., the police) in favor of private justice. Everyone gets to be his own judge, jury, and executioner. Many years ago I was traveling on business, and stayed over at a motel, with my room overlooking the parking lot. Bright and early the next morning, some character was playing hard rock, volume to the max, in his truck with the door open. I wasn’t sure what to say without provoking a fight ….. He laughed and turned it down. No AK-47 rounds were fired. This is a perfect example of the abuse of the second amendment. If the NRA and the gun nuts are so adamant about this god given right, even if they perversely omit the first and most important half, then this abuse of a god given right should be responded to in an equally sacred way. Jail the nut for life. Jail the father who allowed his son’s access to his shotgun and pistol, resulting in the recent carnage. Jail the fu*^ out of those that abuse and threaten this sacred right to arm one’s self to the teeth. It only follows that if something is that sacred, cold dead hands and all that, then the punishment for abusing it should be equally severe. Use a gun in a crime=automatic life sentence, lose a gun that is used in a crime=automatic life sentence, your kid finds your gun and kills someone=automatic life sentence, etc. Put up or shut the fu*^ up. It’s not an abuse of the second amendment, it’s a violation of law. It’s both, however when extremists cherry pick a constitutional amendment, leaving the most important part out, pervert the words to mean whatever, and then threaten the lawmakers whom they have purchased, it is an abuse. If a gun pervert can effectively control the access to guns, allowing nut cases to fall under their perverse position, then the abuses of this right, privilege, whatever, should be commensurate. Lock the idiot up for the rest of his life. The first reason for punishment under the law is to take the perverse perp off of the streets so that it cannot harm innocents. The equally important reason tied for first place is to deter other idiots from stepping over the line. Lock him up and accomplish both. The right of gun ownership should only go to those who do not threaten society. The only one cherry picking is you. Americans have the Second Amendment as a check on the government. Not some notion of hunting or target shooting or even defense against criminals though the massacres of the Indians were surely on their founders’ minds. When the Amendment was written, the citizenry had the same armament as the military. That leveled the playing field. So what you call gun nuts are just run of the mill free citizens refusing to turn their safety and hence their lives over to statists like you who would impose your brand of Marxism but for the real possibility that you’d get aerated on the spot for trying. Sorry comrade, you lose. And thank god. Sometimes you have to go to DEFCON-1 (or 4, whichever is war). There appears to have been no collateral damage. The intended targets and they’re apt. seem to be what he hit. Defcon 1 over kids noise dispute? how depraved would one have to be to either do that? or support that? As for the no collateral damage (“Gaeta was hit three times, including a round in each leg. Smith was hit in the shoulder”) how many have to be injured and/or die b4 trumpettes and ammosexuals care enough about life to put humans before human killing guns? Know your audience, you are talking to an idiot. You might improve the function of your sarcasm detector before you go round calling other people idiots. I forgot he is the great surrealist commenter, my bad. Thanks for reminding me, Nutty. As long as the AK 47 has a silencer on I see nothing wrong with that. “Gaeta was hit three times, including a round in each leg. Smith was hit in the shoulder. Other rounds entered Smith’s apartment. I know our gun/ammosexual society is sick – but you really see nothing wrong with attempted murder? Please, he should use the Zarate defense: “oops! It just went off.” No question a California jury would refuse to hold him responsible for any damage or injury: that is if he’s an illegal with a rap sheet. News flash, if guns were not so prevalent, the only defense you would need is karate. Right. Is that what you tell girls with stalkers? Just use karate.